A 28-year old Century man was seriously injured when he collided with an 18-wheeler in Molino Tuesday morning. 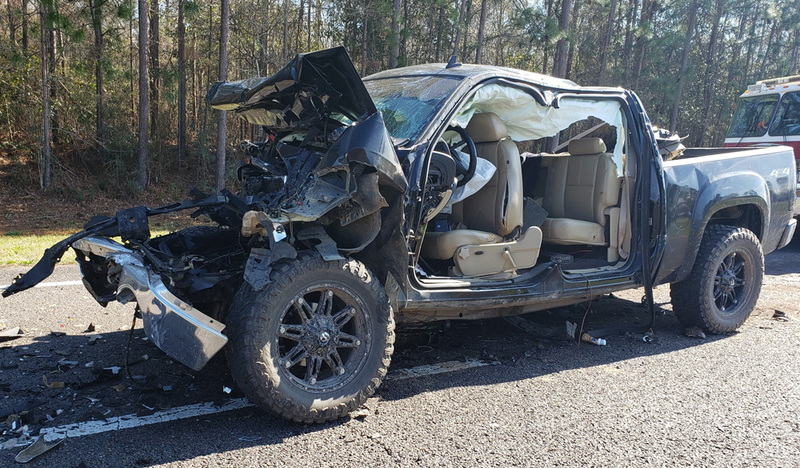 William Hamilton was northbound on Highway 29 northbound near Victory Assembly of God Church when he rear-ended an 18-wheeler just before 11 a.m. 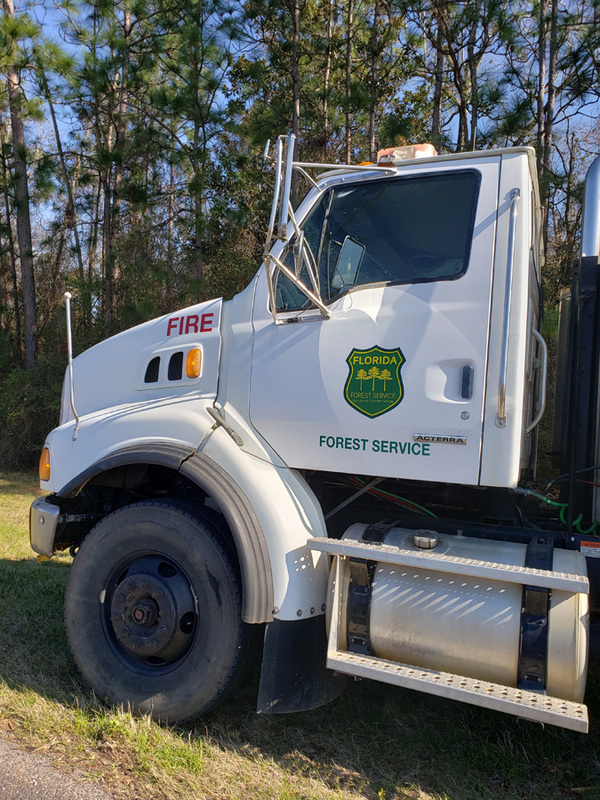 The Florida Forest Service truck had started to slow to make a turn, but Hamilton “failed to maintain awareness”, according to the Florida Highway Patrol. 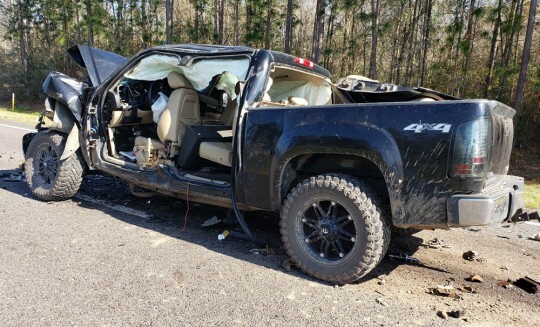 After being extricated from the pickup, Hamilton was airlifted by LifeFlight helicopter to Sacred Heart Hospital. The driver of the Forest Service truck, 23-year old Cody Green of Molino, and his passenger, 40-year old Charles Hazlewood also of Molino, were taken by ambulance to West Florida Hospital for minor injuries. Hamilton was cited by the FHP for careless driving. 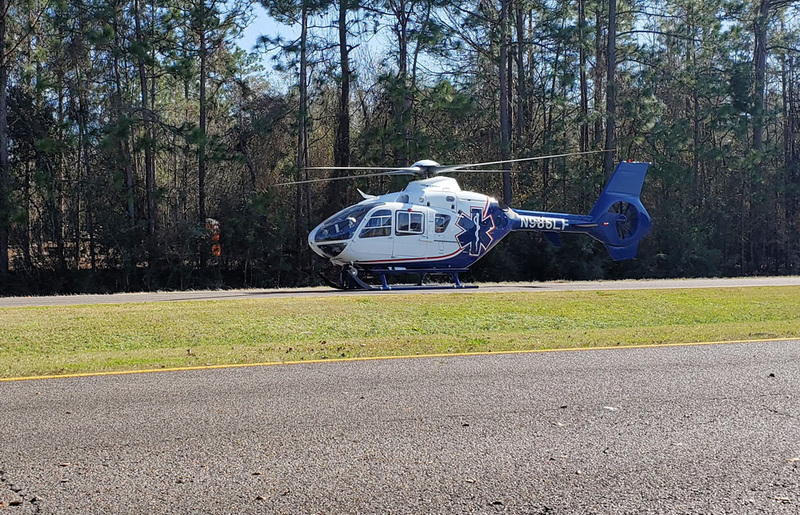 The Molino, Cantonment, McDavid and Ensley fire stations, Escambia County EMS and the Escambia County Sheriff’s Office also responded. Hurt but I believe I’ll make it Got interior pictures out of truck speedometer was stuck on 64MPH femar bone shattered. Todd, the bumper prevented the pick-up from underriding the trailer. I assume this trailer would fall in the special purpose category. 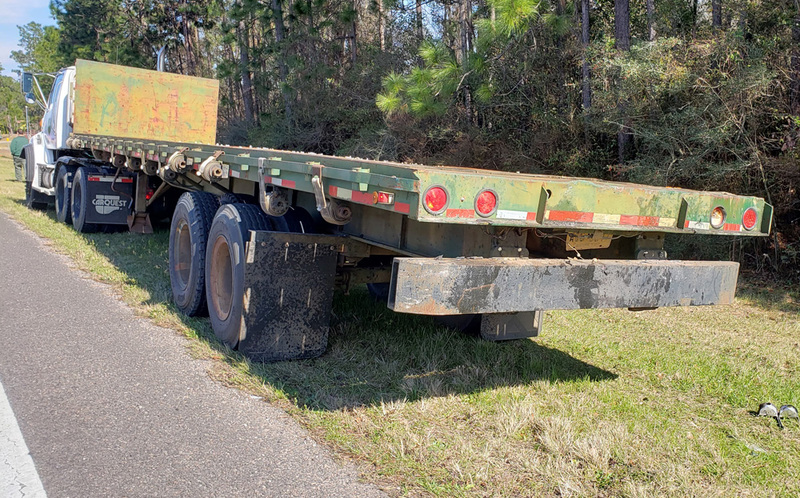 USDOT- Exempted from the rear impact guard requirement are pole trailers, pulpwood trailers, low chassis, special-purpose, wheels back vehicles, and trailers transported in a drive-away or tow-away operation. Praying for u Johnathan! Hope ur going to be alright! For others We’re all human, we’re going to make mistakes! It’s how we learn in life! Dont let mistakes define who a person is, if anything try to help them use em as stepping stones toward a better tomorrow! Yes, I pray that he will be ok so he can go to trial and serve his time for the crimes he has committed. No one wished that he was hurt but he needs to pay for those mistakes y’all keep talking about. Running from the police when you have a warrant is no a mistake. It was his personal choice!!! Pray he recovers quickly! Bless his heart!! Is this the same young man that just got out on bond featured on here in the Century Six ? Luckily the driver is ok! As Cody said, keep negative comments to yourself! People do make mistakes so don’t act like you all are perfect if you have anything negative to say! He has a broken femur bone but is expected to be ok. Prayers! Is this not the same man that was posted about this morning for running away from police? The flat bed trailer on the semi appears to not have a legal D.O.T. bumper.I wonder if it’s exempt because it’s a state Tractor Trailer. Prayers for you, Mr. Hamilton, for a full and perfect recovery from this accident. Also Praying for those who love and support you. So many people nowadays driving 70mph while staring at their phones. I’m not accusing this guy of it without hearing the facts, I’m just saying I see a lot of it everyday. It’s scary. Wasn’t this the guy from the “Century 6″? Just wondering if there was a mistake or if it was just coincidence that there are two top stories with William Hamilton from Century? As a general rule the engine in a vehicle is designed to slide back and under the vehicle in the event of a frontal impact, for safety of course. Looks like it worked this time. I hope he makes it, we are all guilty of not paying close enough attention at one time or another. WOW, From the looks of it, I’m surprised they survived. Praying for all that are involved. Mistakes are made, and sometimes, all it takes is two seconds for something to distract you from your driving, and BAM! 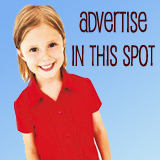 You hit something. So sorry this had to happen to these people. I do hope they will be o.k. WOW, Where did the engine go? 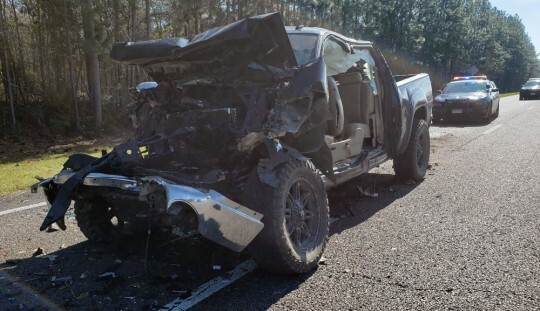 I was caught in traffic with this wreck as well I couldn’t see it that well but I was on 29 going back to Atmore with my Lyft driver. I saw lifeflight close to the road I knew it was going to be bad. I just started praying for anyone and everyone that was involved. Excessive speed, carelessness or whatever. Hope the driver of the pickup survives his injuries. Praying for this young man.